Human beings can be so cruel and so amazing sometimes. 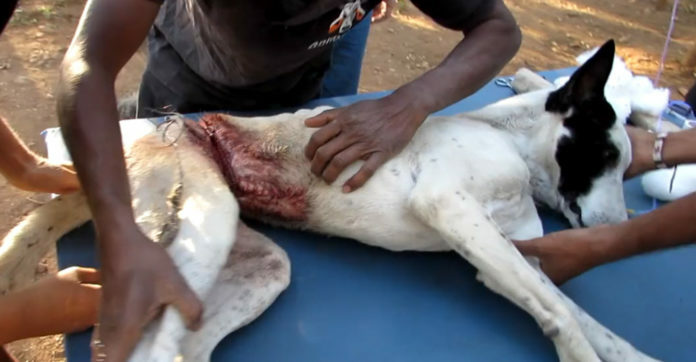 A stray dog living in India was found with a wire around his torso. The dog, now named Ben, was almost severed by the wire. Because Ben was found as a stray, no one has any idea how the wire got wrapped around his body. It had been there for months. It could have been purely an accident. Animal Aid Unlimited was able to get him off the streets and help him out. In surgery, they were able to remove the wire. His rescuers say Ben is a very sweet dog, despite all the pain he was in. It is sad to think that Ben struggled for months with that wire around his abdomen. The important thing now is that he is one happy pup!